Two weeks ago, the acting administrator of the Environmental Protection Agency took the “unusual” step of personally interviewing the probable final candidate to be the agency’s human resources director. “It’s a very critical position” given the agency’s challenges in recruitment and attracting new employees, said Andrew Wheeler—Trump’s recent nominee to be permanent EPA chief—at a Wednesday morning interview broadcast live from The Washington Post. Wheeler said he does not want this newcomer to be “blindsided” when confronted with the assignment of solving the problem. 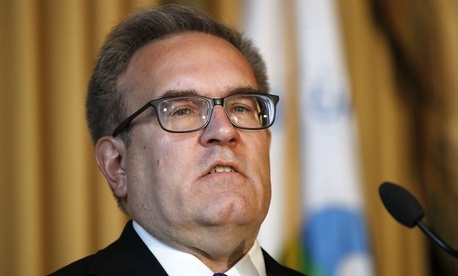 Wheeler denied a suggestion that there has been as “mass exodus” of EPA employees disgruntled by the Trump administration’s regulatory rollbacks and altered positions on climate change. “Forty percent of the workforce is eligible to retire in the next five years, which is a problem for any organization,” he said. “And I don’t think the private sector has figured out how to deal with the Millennials,” who tend to plan on three or four jobs rather than spending their whole career in one, as many of EPA’s people do, he added. He also commended “the hard work of the career employees” who contributed EPA’s share to the 13-agency assessment of global climate change released on Friday. He said he did not even read the report before its release and noted that “the majority of the work” was done under the Obama administration and was undergoing review over the past two years. On reading much of the 1,656-page document, Wheeler began asking staff questions. At the Post, he criticized the document for focusing on “worst case” scenarios and for downplaying the role of “innovation,” technology and markets in addressing climate change damage. “We’ve seen a reduction in C02 of 14 percent” since 2005—“and 2.7 percent during Trump’s first year,” he said, requesting credit for the accomplishment. He said the report’s widely noted prediction of a 10 percent drop in GDP came from an outside report—from liberal billionaire Tom Steyer (who favors impeachment of Trump). And he faulted the scientists for relying on models that factored in only five or six economic indicators, rather than the usual 20. The report’s model “basically freezes technology going forward,” rather than counting on future innovations, he said. Pressed by reporter Juliet Eilperin, Wheeler said he does believe that mankind has an impact on the climate, and “takes the issue seriously,” though he hasn’t talked to the president on the topic since the report’s release. Asked what he anticipated in a more aggressive congressional oversight climate come January with Democrats in charge of the House, Wheeler, describing himself as a former coal lobbyist and consultant who represented 20 companies, said he looked forward to it. President Obama’s team “went beyond the Clean Air Act,” he added. His predecessors also “rushed through” a mid-year evaluation of fuel economy standards and neglected a lot of data.